Most of us have dreams of building the ultimate man-cave but the reality is that a majority of us simply don’t have the option to do so. Your heart’s desire might include an acoustically treated room, 120” projector screen, A/V separates and an endless budget for gizmos and gadgets. So whether it be a home theater, music listening room, or gaming area there’s always a way to maximize your return on investment. The big question is “How do I get the most out of my room?” Here are a few questions to help guide you through the process. The trick is to figure out the purpose of the room and to organize your priorities. What is your ratio for music, movies, and games? Is your room meant for a shared experience with friends and family or a place where you like to hide out by yourself? Determining this will greatly help the direction you go, and especially what additional gear to get. A music room can be as simple as a 2-channel powered bookshelf setup like the Allaire Bluetooth Speakers, all the way up to an ultra hi-fi setup. Music rooms can be great for jamming to your favorite tunes after a long day at work. If you enjoy reading, drawing or doing crafts then music rooms are a great place to hang out during those activities as well. If movies are the priority, then you’ll want to go with a 5.1 or larger speaker setup. While a 2-channel setup will still work for movies, you won’t get the immersive surround sound effects. A surround sound system will liven up your living room when you have guests over or are just hanging out with your family. Don’t forget that every movie room deserves a popcorn maker! For home theater or a gaming room you will need to plan for a few more components than you would for a music room. This list likely includes either a TV or projector, audio/video receiver, Blu-ray/DVD player, streaming options, and any other accessories like speaker wires, HDMI cables, and speaker stands or mounts. Setting a budget will allow you to know how large of a system you are able to build. If you’re building a system on a tight budget, then generally you could start with just a front sound stage. This could be just a stereo speaker pair for starters. Using only a stereo pair of speakers you can achieve what’s called a “phantom center” channel. This can be achieved with proper speaker placement aimed at the listening position. Otherwise, many people start with the front 3 speakers and add the surrounds later. These types of setups will allow you to get the new receiver or other components that you want. Keep in mind that technology is constantly evolving. Usually every couple of years there is some update to the receiver and TV tech. Be sure to budget and plan for these changes if you want to stay on top of the latest trends. For example, 8K is going to become more widely available in the next year or two. The size of room will be a huge factor in determining how large of a system you can install. It’ll also help to determine whether your surround speakers go in the ceiling, or if you have enough space for bookshelf style speakers placed around ear level. An L-shaped couch can also make a pretty big difference while considering the speaker placement for the best sound. Surround speaker placement also requires a little more thought. You wouldn’t want them set in the middle of a walkway, especially if the cables are a trip hazard. You may also question if towers will work in a small room? Of course you can, but we generally recommend at least a 10x10 space for larger tower speakers. Otherwise for smaller rooms usually a set of bookshelves paired with a subwoofer will provide plenty of sound. Surround speakers can also be tricky as many people are unable to run speaker wires from the front of the room to the back. For these unique situations you should consider running the wires under an area rug or run them along the corners of the wall. Another potential option would be a wireless transmitter. Typically your surround speakers will be a passive set of speakers, which require an amplifier to produce sound. There are a couple of wireless options which provide both the amp, and wireless signal transmission. To set it up, you would hook up an outbound transmitter to the receiver, and then the inbound transmitter would connect to the surround speakers. In my personal time, I’m more of a music person, but when hanging out with friends I love video games or a great surround sound action film. Acoustics are usually the first concern when putting together a system in any room. For most of our customers, they’re setting up in an open floor plan - like a family room. These rooms are a bit more of an acoustic challenge than a dedicated entertainment room. You’ll have reflections off windows or blinds, sound will be absorbed into the opening of the next room over, or the vaulted ceilings could cause unwanted standing waves or reflections. In case you didn’t know, there is a difference between sound proofing and acoustic treatment. Sound proofing is meant to minimize the amount of sound going in and out of your room. This can be achieved by using very dense material like a rubber mat and are usually installed between the 2x4’s in your drywall. Whereas acoustic treatment controls sound reflections within the room. If your system is going to be setup on a hardwood floor, then hopefully you’ll be able to lay down an area rug under your coffee table. This will help with the imaging of your speakers and prevent early or first reflections. First reflections mixed with direct sound from the speaker will cause an inaccurate sound at your listening position. First reflections also happen on the walls and ceilings, so you’ll want to do your best to treat those areas as well. There are a number of companies that make absorption panels, or you can also go the DIY route. You can build these by cutting up some wood to build a frame and layering towels within. Another potential acoustic issue could be the bass response. To treat this you will want to use bass traps. Be sure not to go overboard with acoustic panels though as it can cause your room to sound completely dead. Similarly, like a recording studio, you do still want some of that “live” reverb to keep the sounds feeling natural. Most of us will end up working with each unique setup situation and make the best of it. Sometimes you need to make compromises to still make the room work. For example, if you live in an apartment, you may find that you don’t use your sub too often to not upset your neighbors, at least that’s my current situation. Most living rooms have no wall space for acoustic panels, or they simply may not work with your room's décor. Ultimately the goal is to have a setup which is enjoyable and sounds good so you can have fun with friends and family. 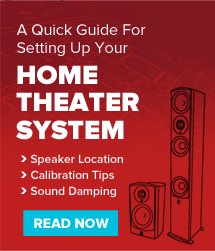 Introduction to Room Acoustics What is Timbre Matching?